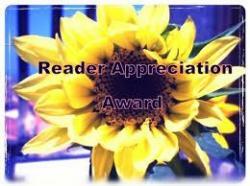 Michelle Fitzurka of Fitztopia nominated me for a Reader Appreciation Award. I’m honored! Fitztopia is a wonderland of photography, Michelle’s art, highlights of other renowned artists to keep an eye on, and much more, all woven together through thought-provoking and heartwarming posts. You should definitely check it out. Thanks Michelle! Identify the awards and who gave them to you. Share 7 items about yourself. I was born in Germany, but in my mid-twenties I moved to Virginia on my own. Quite a culture shock! People peg me for a classical or traditional music type, but I actually listen to hip-hop, disco, motown, reggae, R&B, lounge music, Latin and French music, and some German music. I LOVE animals and horseback riding. I currently have two dogs, four cats, and a horse. When I’m not reading, dreaming, or thinking about interior design, I love to watch murder mysteries on TV (the non-bloody kind like Midsomer Murders and Murder She Wrote). I love warm weather, but in spite of cold winters, I love New Jersey. My daughter redecorates her room, including moving her furniture and tapping into my inventory, on a monthly basis. Wonder where she got that from? NOTE: Many of my comments go to spam. Therefore, if your name is on here and you don’t receive a comment either check your spam folder or just copy and put it on your own page. Categories: Interior Design & Decorating | Tags: blogging, blogging award, interior design, reader appreciation award | Permalink. Congratulations Iris! I am already checking out your 10 blog nominees and loving them! They’re all great and must-reads! Congratulations to you too! I love your blog and think you have a unique creativity. Which is why I’m a devoted follower. Congratulations on your nomination, Iris! I am thrilled to have been included as one of your nominees! I’m so glad you’re happy! I love your blog and felt like you should know that I truly appreciate it! Congratulations and thanks for the nomination. I greatly appreciate your kind words about my blog. Love yours too. Of course, I’m in spam again! You’re very welcome. I absolutely love your blog.